Zerol bevel gears are the special case of spiral bevel gears with a spiral angle of 0&deg;. They are manufactured in a single-indexing face milling process with large cutter diameters, an extra deep tooth profile and tapered tooth depth. It is well known that hobs with straight-sided teeth do not cut true involutes. In this paper, the difference between the straight side of a hob tooth and the axial profile of an involute worm is evaluated. It is shown that the difference increases as the diametral pitch increases, to the extent that for fine-pitch gearing, the difference is insignificant. Publisher Michael Goldstein talks about the slow but steady pace of the recovery of the manufacturing economy. Dutch design and Swiss ingenuity cause transmission breakthrough. Updated examples of Cylkro face gears in action. The complete Product News section from the November/December 2010 issue of Gear Technology. 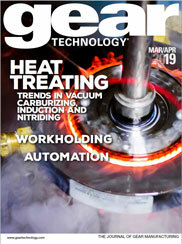 The complete Industry News section from the November/December 2010 issue of Gear Technology. The Addendum team uncovers gear industry bigwigs caught by the paparazzi on the covers of OTHER magazines.